My location: border Republika Srpska and Montenegro. I use Inverto IDLB-TWNL40-Ultra Black Ultra Twin LNB. Checked all regular channels but no signal. Also I tested the 3.Bundesliga feed on 12624 V 10000 without success. 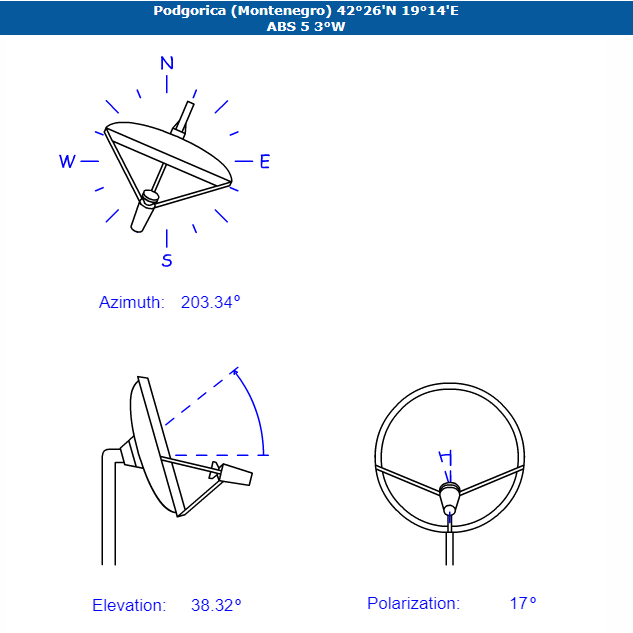 Sadly satlex site, which I use for azimut, elevation and skew setting doesn't provide 3.0°W configuration. Is it similiar to 4.0°W? ABS 5 which is located at 3W is the former name of ABS 3. Not motorized so I also manually adjust antenna. I would expect those 3.Bundesliga feeds are spotbeams for german area cause only german IPTV Provider Telekom broadcasts them. But this is just my interpretation. @Peugeot207: Dishes with 80cm and 105cm.